In our look at St Magnus Festival events we forgot to mention a performance, which although not taking place in Stromness, does have Stromness connections. Erland Cooper who grew up in Stromness and whose parents still live here, is part of the band The Magnetic North along with Simon Tong (ex Verve and Gorillaz) and Hannah Peel. 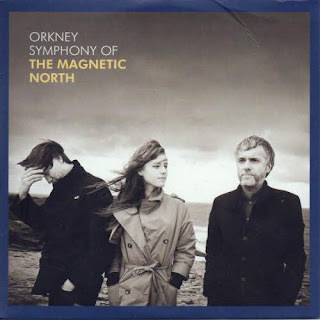 They will be performing their debut album Orkney Symphony of the Magnetic North on Thursday 28th June in St Magnus Catherdral at 7.30pm. The album is inspired by the landscape and legends of Orkney and was recorded locally on location and in Erland's family home in Stromness. It features contributions by the Stromabank Pub Choir from Hoy who will join the band for Thursday's performance. Here is the video of The Magnetic North's track Stromness from their album.